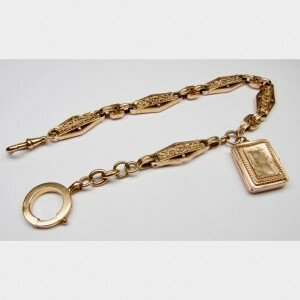 Pocket watch chain in 18KT gold from the beginning of the 1900's, total weight of 17 grams and 37.5 cm in length. 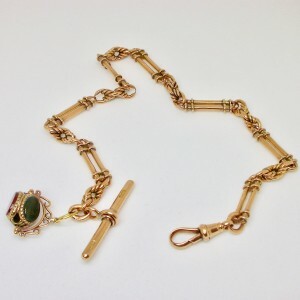 English Victorian watch chain, in gold for 23.6 gr. with handcarved details. Length: 35 cm. Watch chain in 18 carat gold for 29 gr. Finely hand crafted with picture holder, early 20th Century. Length: 31 cm.